Out with the old, in the with the new. Another year is approaching and as I put away the Christmas gifts and hold onto my Irish-ed coffees as tightly as I can, I know that the holidays will soon be over. It will be time to shake off the sugar rush (easier said than done for my treat-crazed three-year-old). We will move on with life outside of festivities, and focus on improving the life that we are living. So what shall the focus be on this year? What goals are on my New Year Resolution list? 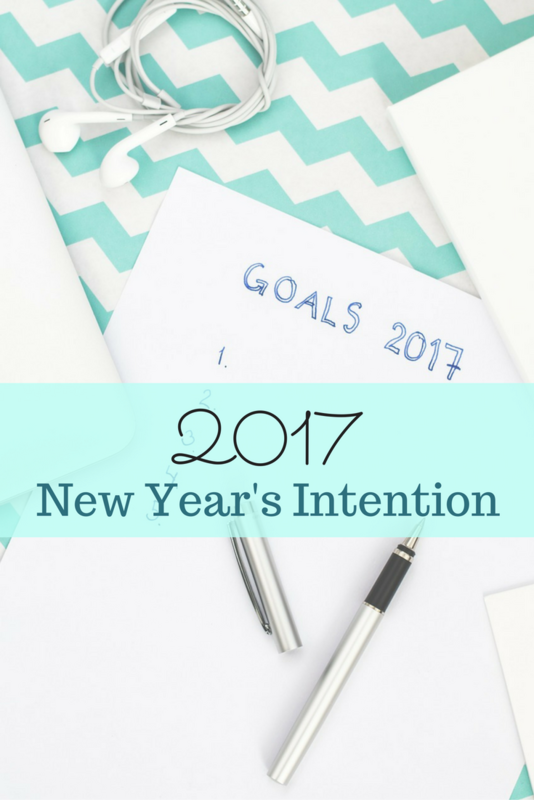 Last year I did away with the traditional New Years resolutions in favour of taking up a new tradition that it seems much of the blogosphere has taken on: Setting an intention. A single word to remain at the front of the brain throughout the year, to help guide you to delve deeper into discovering this word and making it a more prominent part of your life. Having come a full year with this one-word intention, I’m finding that the New Year is easier to handle. Rather than looking back at a set of exciting goals that didn’t come to fruition, I am comforted by the fact that I did make some major headway in my goal for 2016. It reminds me more of an I-Did list situation, bringing thoughts of the last year’s successes to mind to feel successful in my growth, than to focus on what wasn’t crossed off a list. So this one-word intention thing is what I will do again this new year. Looking back at last year in relation to my chosen word, I have to admit that my word shifted ever so slightly. I set the stage last year (you can read that post here) with the word “focus”. Being my first year of this one-word tradition, I think I went overboard a bit, shooting higher than I comfortably was ready for. If you read that New Year resolution post, you’ll see how I intended to break “focus” up into parts (way to over-complicate something) and figured that in 12 short months I would be Queen of Focus. The first “step” in this process actually turned out to be what I focused on this past year, and the word I would say was the true intention for my year: Simplify. In a million little ways, I discovered more deeply how to simplify my life, and how amazing it feels to have more simplification in all areas. I decluttered my home with the KonMari method (and still have a few categories to purge), I simplified responsibilities and let go of ones that didn’t fit in my life. I welcomed less into my life and chose carefully what that would be. I said goodbye to books I would never read, and crafts that were blocking the mental view of what I’d rather be doing in my spare time. I went into holidays and celebrations with little preparation and no strict to-do list for what needed to happen to make the occasion a “success”. Instead I focused on being present and going with the flow, allowing the simplicity of everything to grant me the time and space to simply enjoy what was going on around me. This year was by far the most enjoyable, and the least prepared for. Only a couple of gifts were purchased, we stayed in our home, and food was simple. Instead of rushing around racking up our credit card (we did enough of that in Costa Rica, after all) and fretting over the million foods and treats we could make, we focused our energy on a few things that did mean the most to us. That’s one of the most important lessons I’ve learned through 2016’s New Year resolution to simplify: When you take out the frills, all the extra “should” and “could”, the parts that really matter to you become highlighted and can truly shine. Birthdays, trips, holidays – all were simplified. No, we didn’t go to Christmas concerts or bake a dozen different kinds of cookies, we didn’t go sit on Santa’s lap or follow an advent calendar each day, but we laughed and smiled and played every day. And we even ended up with our first 100% homemade gingerbread house. For every thing you don’t do, you gain time for something else. Simplify, simplify, simplify. And now, while I still plan on continuing to keep simplicity in mind this year and forever forward, it’s time to switch gears to something new. I can feel it’s time, even without looking at the calendar. While my home and my mind have become so much clearer, cleaning out the unnecessary things and thoughts, I can see very easily that I’m in serious need of a new focus. This coming year, in 2017, my New Year resolution comes down to this one word (or rather, two words hyphenated to become one): Self-care. In the past few months I’ve really been noticing how my body is aging, and how temporary and fragile this physical existence is. And how poorly I’ve been caring for myself. I was going to say “since I’ve become a mother”, but honestly, my self-care skills have always been seriously lacking (except for those 3 months of detox/insomnia/super-clean-freakism I experienced in my first home living by myself after high school – but that’s another story). No one can possibly expect live a long and healthy life when they eat crap (when they do eat), drink copious amounts of coffee every day, sleep 3-5 hours every night (I just hate calling it a night! ), enjoy wines and ciders almost daily, take no rest, stay constantly busy, and neglect their body. It’s shameful, really. So this year will be all about me, taking care of me. This might mean pushing myself to exercise, drink more water, and eat healthier, and allowing myself the time for special treatment, primping and relaxing that my whole self will benefit from. I expect to find a balance to taking proper care of my body and mind, finding the right ratios between action and relax-ion. Let’s see what the new year holds. Thanks for being with my on my journey, folks. You have no idea what it means to me that I’m not alone out here with my thoughts, ladies and gentlemen. Do you have a new year resolution, or some thoughts about mine? Please, if you have a moment, leave me a comment, either in the space below or on one of my social media accounts: Facebook, Twitter, Pinterest and Instagram. You can also sign up for my short and sweet weekly e-notification about what’s new on The Big To-Do List. You can do that here, or head to this article with a free kids’ song cards printable and sign up there to get access to the free printable I made. Pssst… and if you’re interested in seeing some of my best memories from 2016, most of them are found within my 29 Things I Did in my 29th Year post (just exchange the 2015 Christmas stuff with 2016’s, and add in a trip to Costa Rica).